Private: 66 George W FORREST. Born: 1857. Tyrone, Ulster, Ireland. Married: 7th March 1896. Randwick, New South Wales, Australia. Marriage Cert:3753/1896. Wife: Mary A Forrest. nee: Ball. (18..-1898) Waveley, N.S.W. Death Cert:16507/1898. Died: 7th June 1917. Killed in Action Messines. 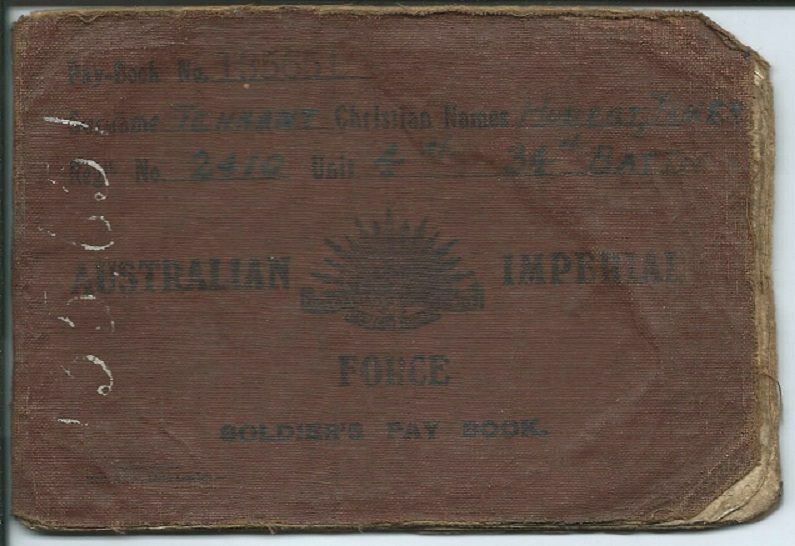 INFORMATIONGeorge Forrest enlisted with the Royal Australian Artillery on the 12 December 1883 and served as a Gunner/Driver: Service Number: 1090 with A Battery and returned to Australia on the 3rd March 1885 on board the S.S. "Arab". 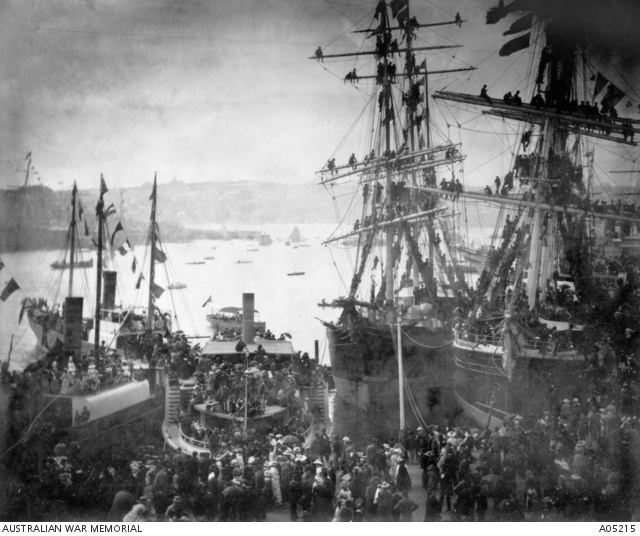 Sydney Harbour 3rd March 1885 when the Australian contingent sailed for the Sudan. Sudan Campaign.In February 1885, the New South Wales Government offered a Battery of Artillery and a Battalion of Infantry for service in the Sudan. 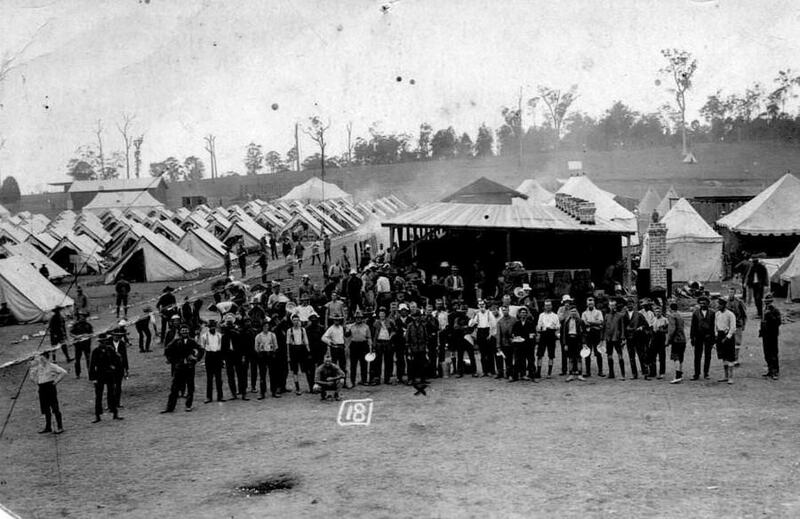 On the offer being accepted by the British Government, A Field Battery was assembled from the New South Wales Artillery and was ready for embarkation within two weeks. The Battery sailed on the 3rd March 1885 on the transport Iberia and Australasia. The Battery landed in Suakim on the 30th and 31st March,but was to see limited action as the campaign was almost at an end. The Battery embarked on the 17th May 1885 for return to Australia and was commended by the Commander-in-Chief, Sudan, Lord Wolsley for its most soldier-like appearance and exemplary conduct at a review a few days previously. In 1899, when the South African war commenced, all the Colonies in Australia offered military assistance to England. 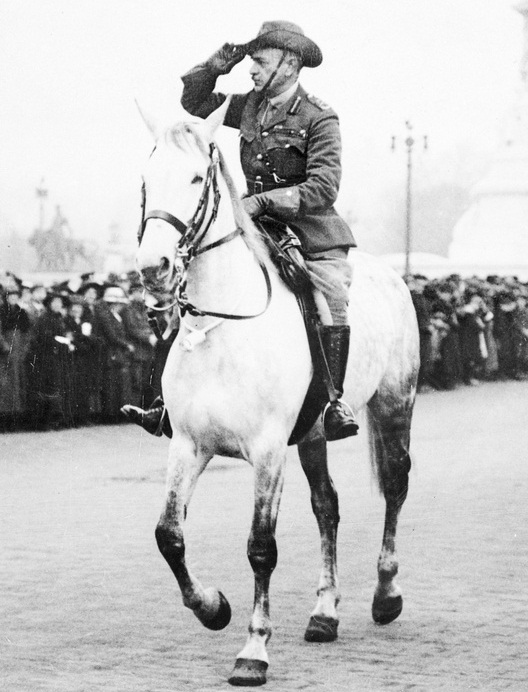 These offers were accepted in that the Colonies were requested to send mounted infantry or light horse only. After the action at Magersfontain, New South Wales offered to send a battery of Artillery to South Africa. 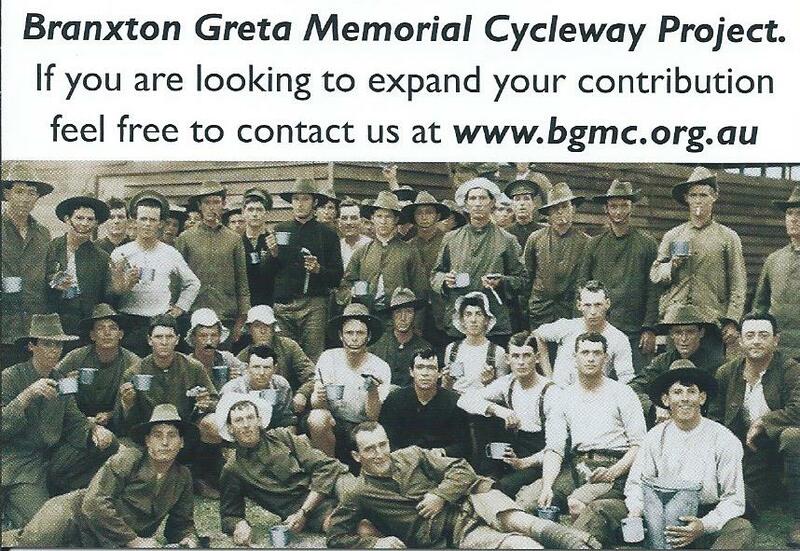 This offer was accepted and immediately A Battery Royal Australian Artillery was formed from Officers and Men of A Battery New South Wales Artillery, and on 30th December 1899 on the transport to Warrigal, the Battery embarked from Sydney to South Africa. A Battery having completed about 18 months of continuous active service, was order home in July 1901. The Battery embarked at Cape Town on the transport Harlech Castle on the 12 August 1901 and arrived in Sydney on the 15th September 1901. During its service in South Africa, A Battery had one man killed in action, one man died after being kicked by a horse, while 45 men were invalided home through sickness. 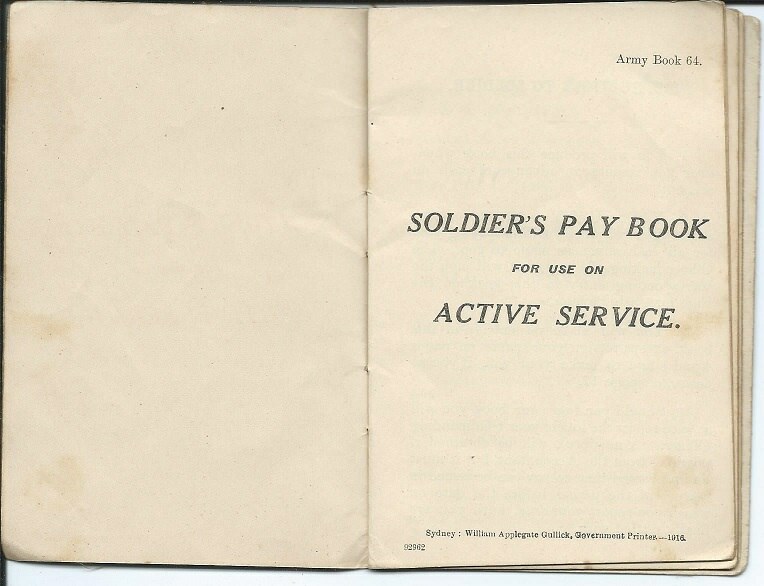 On the 1st December 1910 A Instruction Cadre was redesignated as No 1 Battery Australian Field Artillery Permanent). Original strength: 175 and six guns, followed by 44 reinforcements. Subunits: three field artillery sections of two guns each. Commanding officers: Colonel S. C. U. Smith, then Major E. A. Antill. Left for South Africa: 30 December 1899 on Warrigal, A detachment of 1 officer 1 NCO and 10 ORs commanded by Lt (T/Capt) A Fitzpatrick RAA departed on the Langton Grange on 14 Nov 1899 Newcastle. A reinforcement draught of one officer and 43 ORs departed on the Maplemore 17th March 1901 under command of Lt R G King. Service: February 1900 - August 1901 in Cape Colony and Transvaal; the only professional Australian military unit to serve in South Africa. Fatal casualties: one killed, two died of disease. Decorations: none. Returned to Australia: 15 September 1901 on Harlech Castle. 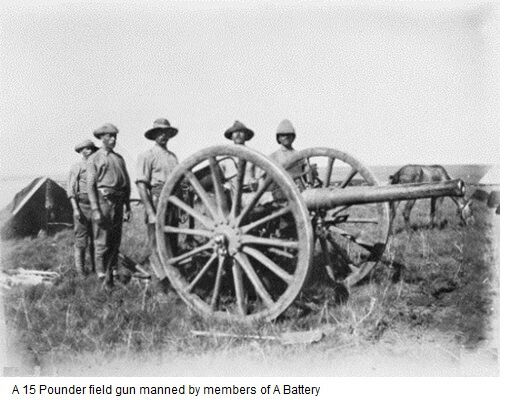 A Battery; 15 Pound Gun during the Sudan Campaign.A Battery RAAGeorge served with the Royal Australian Artillery for 19 years and received the Queen South Africa Medal with Bars; Cape Colony. Orange Free State. Transvaal. South Africa 1901. He and also received the Long Service and Good Conduct Medal. 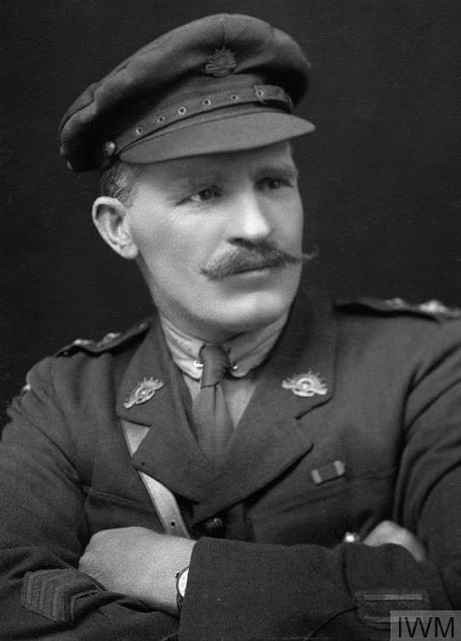 His World War 1 service entitled him to receive the British War Medal and Victory Medal. 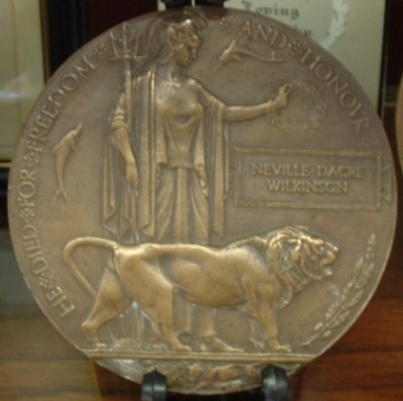 As he was killed in action a Memorial Plaque and Scroll was issued to his next of kin. George enlisted at Newcastle with A Company 34th Battalion AIF on the 19th January 1916 and was marched in to the Rutherford Recruitment and Training Camp where strenuous training was carried out. The men were very keen and fit, whilst their comfort and health were made a special study. Food was good and ample and sports and recreation were not overlooked. MAITLAND CAMP RUTHERFORD N.S.W. 1916.On 1st May 1916, the Battalion left by Train from Farley Station for the Showground in Sydney, equipped with kit bags and necessary clothing, and was reviewed in Moore Park by General: Gustave Mario RAMACCOTTI. 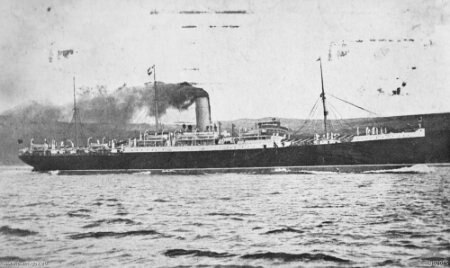 On the following morning, 2nd May 1916 the men embarked on the transport HMAT A20 "HORORATA" and sailed at 4:00 pm". H.M.A.T. 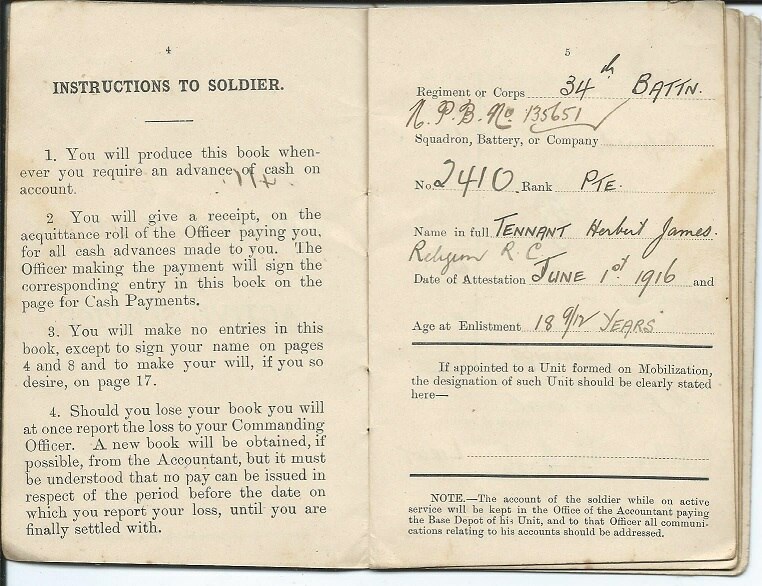 A20 "HORORATA"Devonport was reached on the 23rd June, the Battalion disembarked at Plymouth at 1:00 pm and en trained during the afternoon for Amesbury, arriving at midnight and marching to hutments at No: 1 Camp, Larkhill. 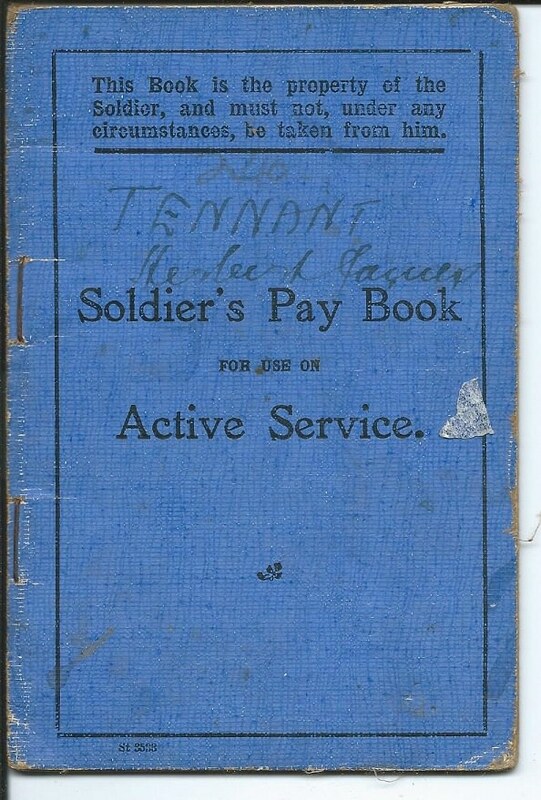 Here the Battalion settled down to hard training, which included Route Marching, Trench Digging, Bomb Practice, Musketry and general Camp Routine. Later the Battalion moved to the No: 25 Camp and finished off their training, which included six days' battle practice and field work at the Bustard Trenches.The 34th Battalion left Larkhill on the 21st November and en trained at Amesbury for Southampton, embarking on the S.S "Arundel". The transport section left by S.S. "Princess Victoria". The Battalion arrived at Le Harve, France on the 22nd November 1916. Disembarkation commenced at 8:00 am and the Battalion marched to No;1 camp on the Hill, arriving at 2:00 pm. The men carried heavy loads, in some cases amounting to miniature Q.M.' Stores. The march over cobblestones was very tiring, notwithstanding the many route marches which had been carried out at Larkhill. However, after bathing their feet and receiving treatment, as well partaking of a good meal, some spent a comfortable night. George reported to Hospital on the 10th March 1917 suffering from Diarrhea after treatment was received from the 11th Australian Field Ambulance he was sent to the Divisional Rest Station before he was marched in the the Reinforcements Camp. 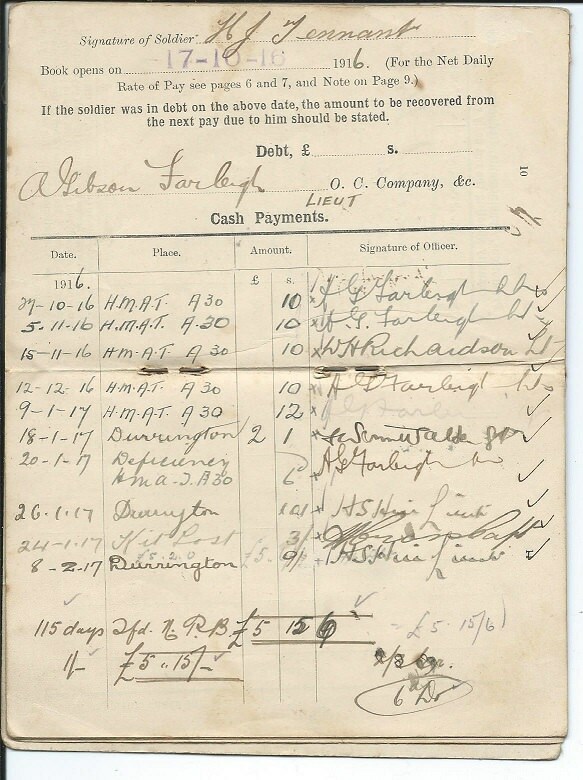 George was marched out and rejoined his unit on the 28th of March before moving into the Forward Lines. THE BATTLE OF MESSINESThe 3rd Australian Divisions first major offensive was at Messines Ridge on the 7th June 1917. The Australian 3rd Division was a part of the II Anzac Corps which was allotted to the first assault. The 25th New Zealand, 3rd Australian Division with the 4th Australian Division in reserve. The 4th Division were battle hardened troops who had fought many major battles.The 3rd Australian Division were having problems getting to the "jump off" point. The day before the 9th and 10th Infantry Brigades were bombarded by German Gas-Shells around Hill 63 and Ploegsteert Wood. Many of the Aussies were not wearing gas masks, but despite this they pressed on even though they received 500 casualties.They made it to the "jump off" point but only just with some of the men from the 9th and 10th going straight over the top without stopping. The mines went up and the attack commenced behind a protective barrage. The II Anzac Corps were attacking on the right with their objective being the southern shoulder of the ridge which included Messines, the Dover and St Yves areas as far south to the east of Ploegsteert Wood. By 9:00 am nearly 6 hours after the assault began the Germans were in disarray, but there was a major problem as the Australians received less casualties as anticipated and when ordered to dig into the ridge they had so many men, that some could not find shelter. the 35th battalion were dug in around Seaforth Farm. Once their objectives were taken the troops consolidated. A barrage to stop and counter attack was shortened and caught three battalions which had to retire. By 9:00 pm this part of the Oosttaverne Line was abandoned. At 10:45 pm General: Alexander GODLEY ordered the 3rd and 4th Divisions to retake it. This they did by the early hours of the 8th of June. 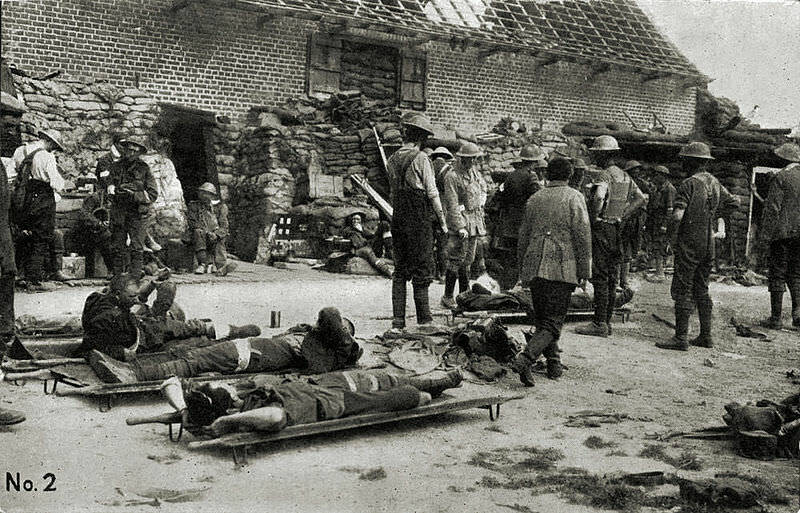 FIELD DRESSING STATION, MESSINES 7th June 1917.George was the Batman to Captain: William Walter MATTHEWS. (A Company Commander) and was reported as Missing in Action during this action but was later changed to Killed in Action at Messines.Informant: Corporal: 69 Harold William Francis FRAZER. 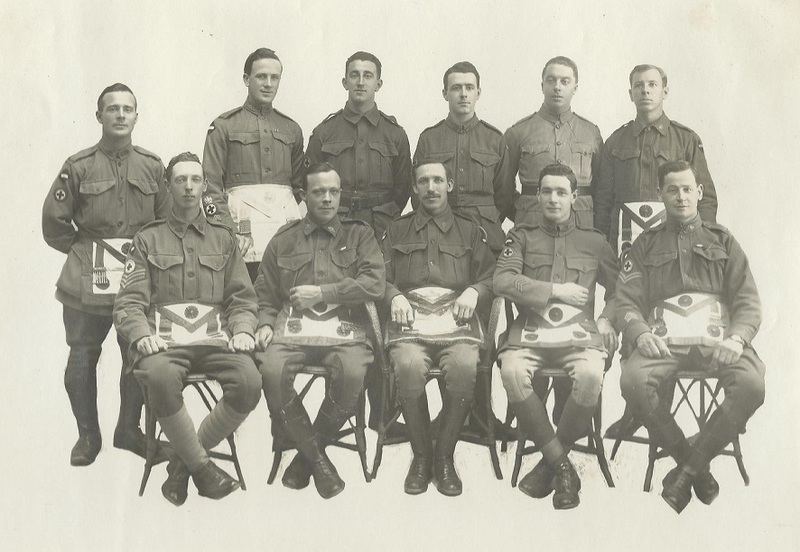 34th Battalion AIF. "He was Batmen to Captain W.W. MATTHEWS and begged to be allowed to take part in the big advance at Messines on the 7th June 1917. By no wish of the Captain he did so. On the morning of the 7th between the hours of 3 and 8, he was killed instantly by a shell near Ploegsteert. He was buried next day in company with many others I was not a eye witness to the burial. Captain MATTHEWS has since returned to Australia and is residing in Wallsend. Home Address; Angledool Post Office, N.S.W. Informant: Captain: William Walter MATTHEWS. 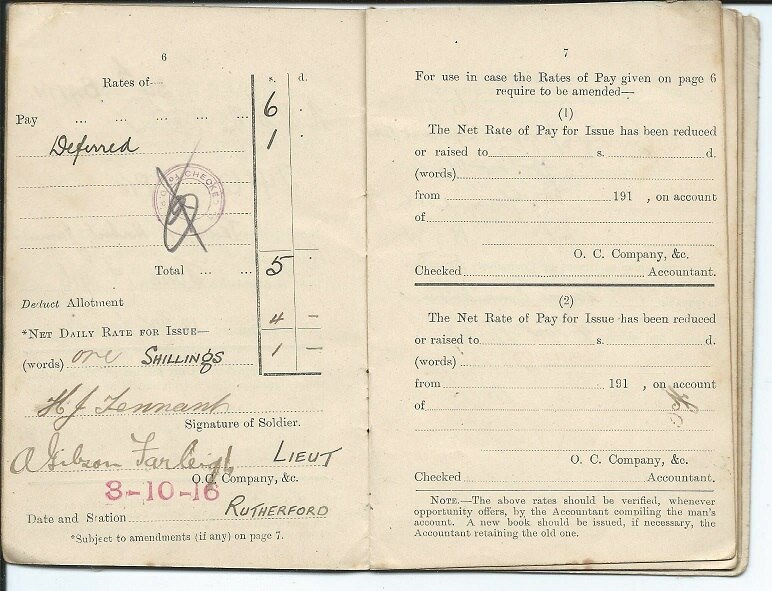 Private: George FORREST who was my servant, and a brave good soldier, who had been all through the South African War, was with me in an attack on the Germans, at Messines. We went over together and he was never seen again. I don't believe he was taken prisoner, because we were pursuing them long afterwards, and they were too far away. I feel sure he was blownup in our own big mines. I have a photograph of him. 3rd General Hospital, Wandsworth, London. 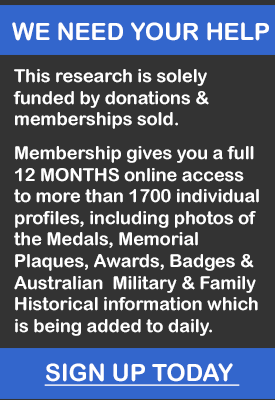 Family InformationGeorge was a single 25 year old Groom when he enlisted with A Battery RAA in 1883. 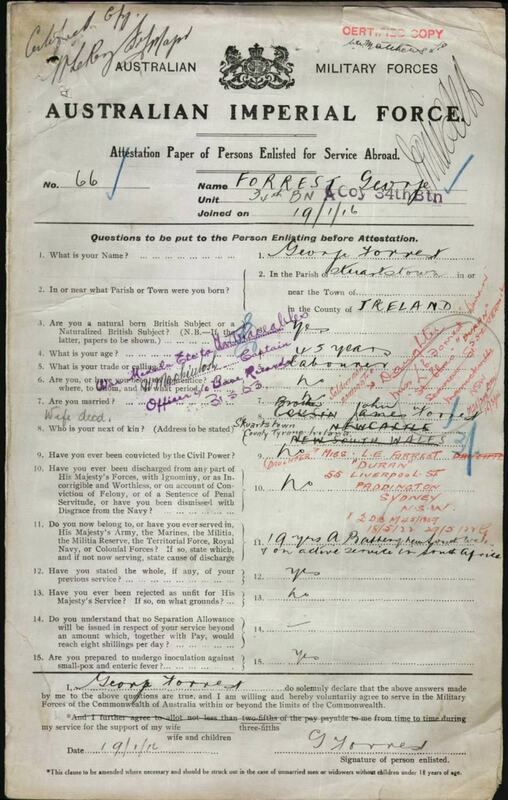 Brother John Forrest was recorded as his Next of Kin. His daughter Lynda Elizabeth Forrest born 1898 at Paddington, N.S.W. Birth Cert:6051/1898 was later recorded as his next of kin in 1917. 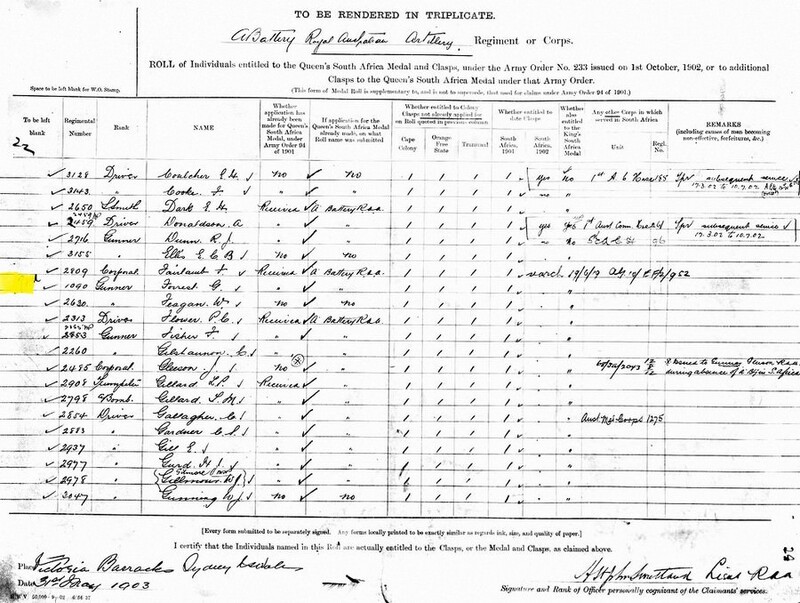 George also had recorded a James Forrest who was his cousin from Newcastle on his attestation form. There was concerns who was entitled to his service medals but from army documents it appears that his daughter Lynda Elizabeth Forrest was accepted as his next of kin as per his will dated 1917 whilst he was in France. 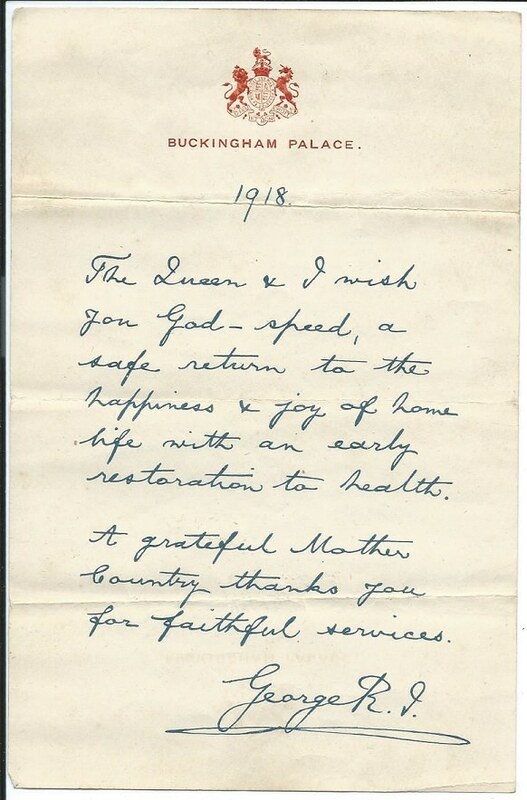 His records do NOT show that these were signed for as no reply was received from correspondence sent to her. A Miss M Twist from the Glebe Colliery Hotel in Wilston Street, Merewether, N.S.W. corresponded with base records in Melbourne on a number of occasions regarding his condition as he was reported being killed in action. Frances E Wyatt from "St Elmo" Seaview Street, Marrickville, N.S.W. wrote that she was the "Natural Guardian" of Linda Elizabeth Forrest who was now 18 years of age.Frances E Wyatt was the mother of Mary A Forrest who married George Wilson Forrest on the 7th March 1896. Mary was herself a widow at the time of their marriage. Mary died in 1898 and subsequently left Sydney in 1900 on board the S.S. Werrigal for South Africa. Upon his return in 1902 he lived in Sydney but moved to Newcastle a short time later leaving his mother in law Frances Wyatt to care for his daughter in law and daughter Linda in Sydney. George moved to the Glebe Colliery Hotel in Wilton Street, Merewether, N.S.W. No correspondence or financial support was made to his daughter or step daughter whist in the care of his mother in law. 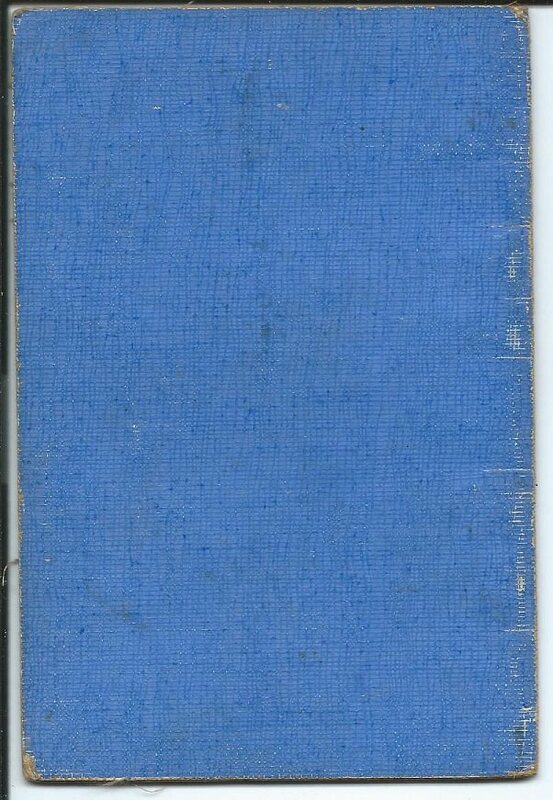 His brother in law Private: 1266 Daniel John Alfred WYATT 36th Battalion AIF, met George in Salsbury Plains in 1916 during World War 1 before Daniel returned to Australia. Private: 2410 Hubert "Herbert" James TENNANT. Born: 1897. 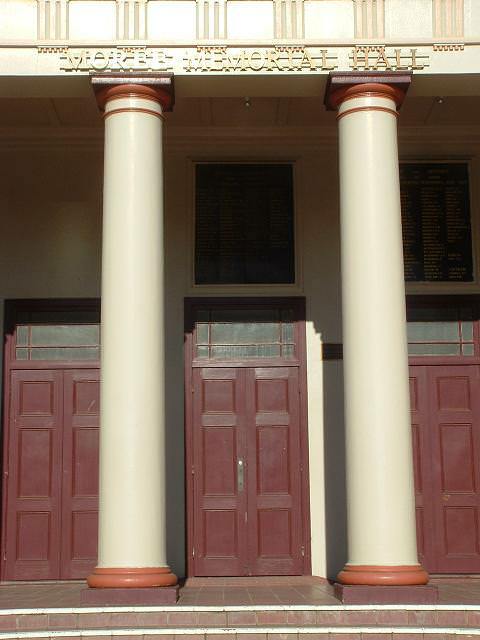 Gunnedah, New South Wales, Australia. Birth Cert:22168/1897. Died:1967. Newcastle, New South Wales, Australia. Death Cert:22580/1967. Father: Patrick Joseph Tennant. (18..-1961) Died at Newcastle, N.S.W. Death Cert:25453/1961. Mother: Sarah Lydia Tennant. nee: Ferrier. 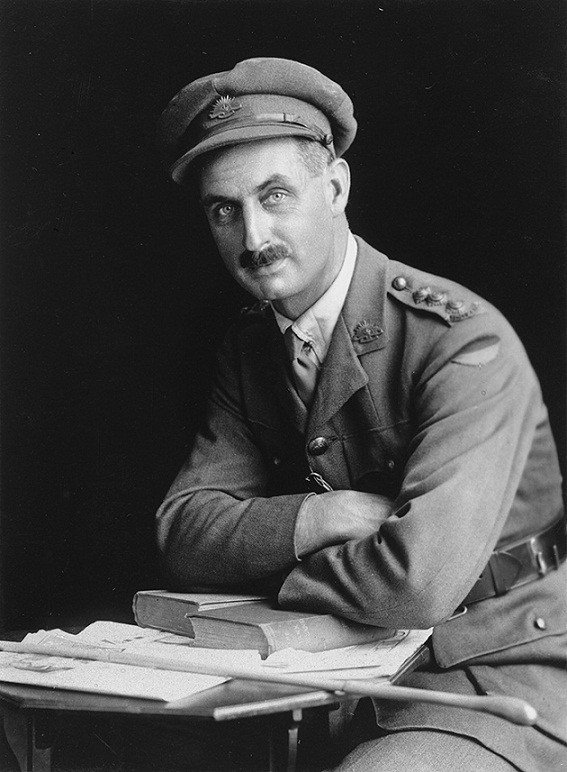 (1877-28.12.1942) Born at Tamworth, N.S.W. 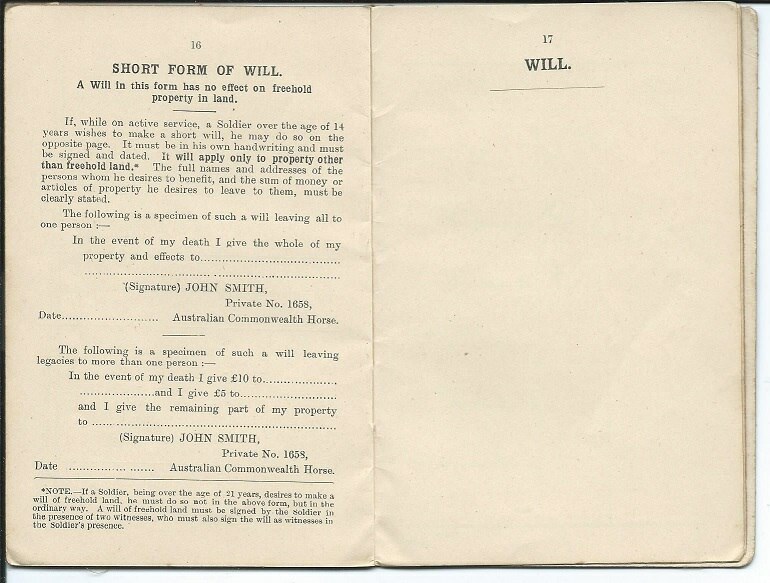 Birth Cert:20981/1877 and died at Mayfield, N.S.W. Death Cert:28027/1942. 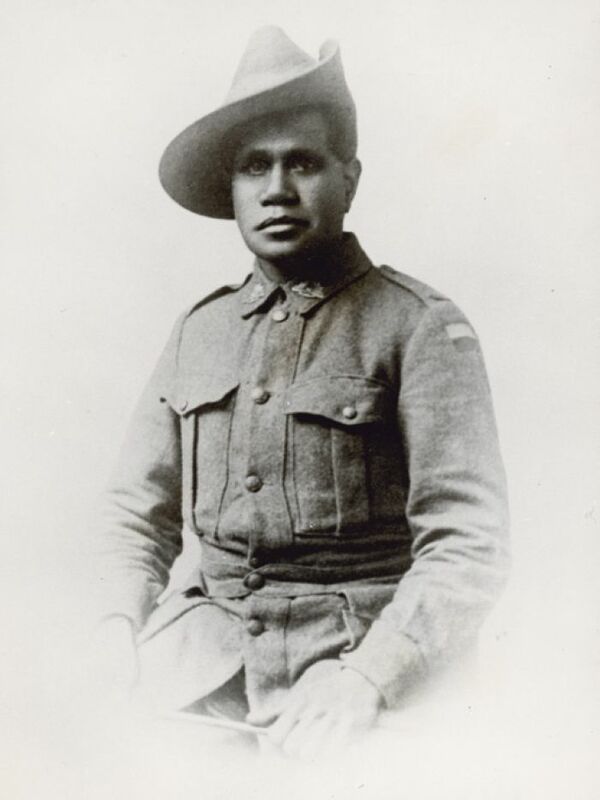 Hubert James Tennant served with the 13th Infantry Militia prior to enlisting at Narrabri, N.S.W. on the 1st June 1916 where he was allocated to the 4th Reinforcements, 34th Battalion AIF. 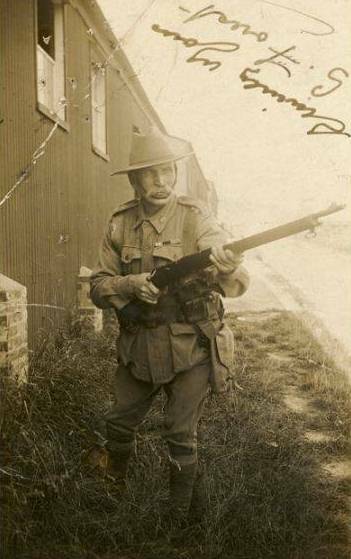 Herbert was en trained to the Rutherford Army Camp where strenuous training was carried out. The men were very keen and fit, whilst their comfort and health were made a special study. Food was good and ample and sports and recreation were not overlooked. On the 16th October 1916 the 4th Reinforcements en trained from Farley Station for Sydney where they embarked on board HMAT A 30 "Borda" from Finger Wharf at Wooloomooloo Bay, Sydney on the 17th of October for England and disembarked at Plymouth on the 9th January 1917. The 4th Reinforcements were marched in to the Durrington Amy Camp at Larkhill with the 9th Training Battalion. Here the Reinforcements settled down to hard training, which included Route Marching, Trench Digging, Bomb Practice, Musketry and General Camp Routine. Hubert proceeded overseas for France via Folkstone on the 25th April and went into billets before being marched out to the lines where he was Taken on in Strength with the 34th Battalion on the 30th of April. Le TOQUET Runners getting plenty of work, one runner blown to pieces bringing confirmation of S.O.S. enemy came over about 200 strong in 3 waves. Lieutenant: 1118 William Wright EDMONDS. on duty sent up S.O.S. and out artillery barrage came down at once and caught enemy's rear lines. Five Bosche got into our trench but were immediately killed. Our Lewis Guns caught them in NO MANS LAND playing great havoc. Estimated we killed 25 to 30 Bosche and we also took one hundred wounded prisoners. Lieutenant: 1118 William Wright EDMONDS.recommended for M.C. 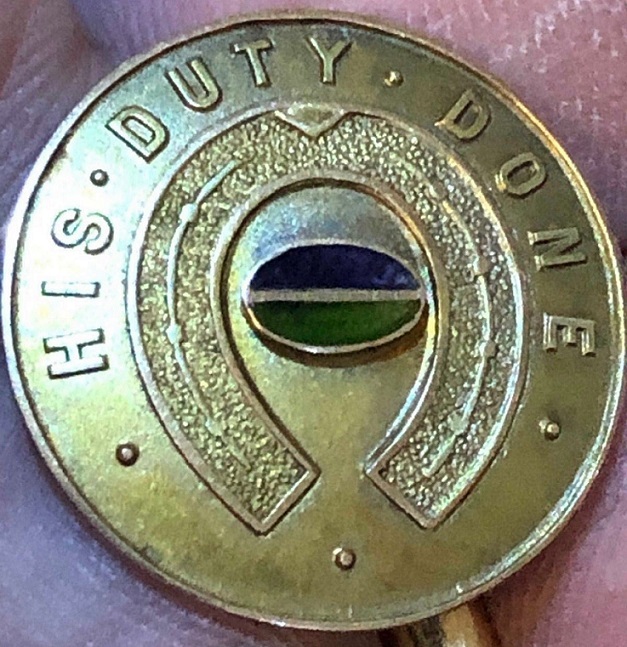 for his work. One Lewis Gun continued firing after being bombed and losing 4 of the team. Lieutenant: 717 Benjamin Greenup BRODIE. scouted NO MANS LAND and found several dead Bosche and various odds and ends he collected altogether abour 12 identifications. Relieved by 36th Battalion and went into Billets at Pont de Nieppe. Enemy shelled Pont de Nieppe, several civilians hurt. Nothing doing, men having a rest. 9:00 pm. Moved into Billets in Ploegsteert Wood and took over from 37th Battalion. Relief completed at 3:00 am. Our guns have been strafing the Germans all night. Our artillery very active on these two days, various wire cutting shoots out by 4.5 and 18 pounders, also gas shells. 9:00 pm. Relieved by 33rd Battalion in Front Line and wire relieved by 35th Battalion. Our Trench Mortars very active on enemy gaps, wire etc also "L"Group artillery fired 1400 rounds on enemy communication supports. 38th Battalion raided enemy, put over 200 strong. 9:00pm. 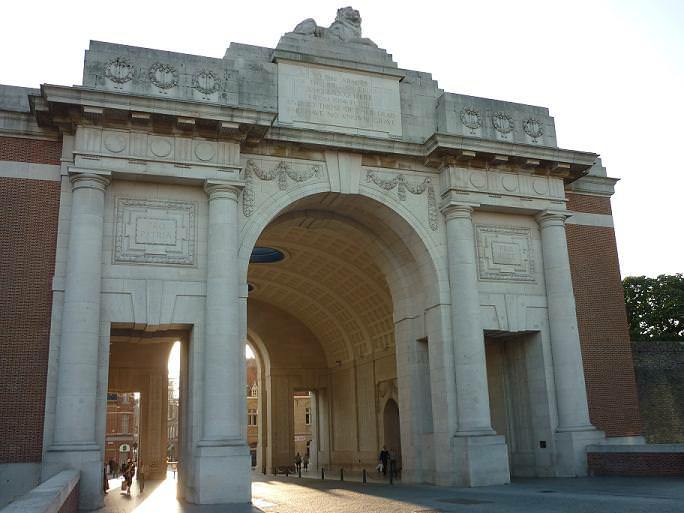 Releived by 35th Battalion and went back to Ploegsteert. PLOEGSTEERT WOOD Artillery of both sides very active, particularly during parts of the night when our 60 pounders and 6" Howitzers put it over the enemy. Out Trench Mortars and Medium Trench Mortars bombarded enemy front and support lines. 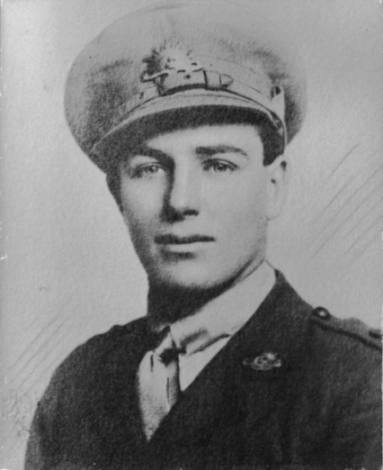 Hubert was Wounded in Action; 1st occasion on the 30th of May and was treated by the 10th Australian Field Ambulance for Gas Poisoning before being transferred to the 55th Casualty Clearing Station the next day. 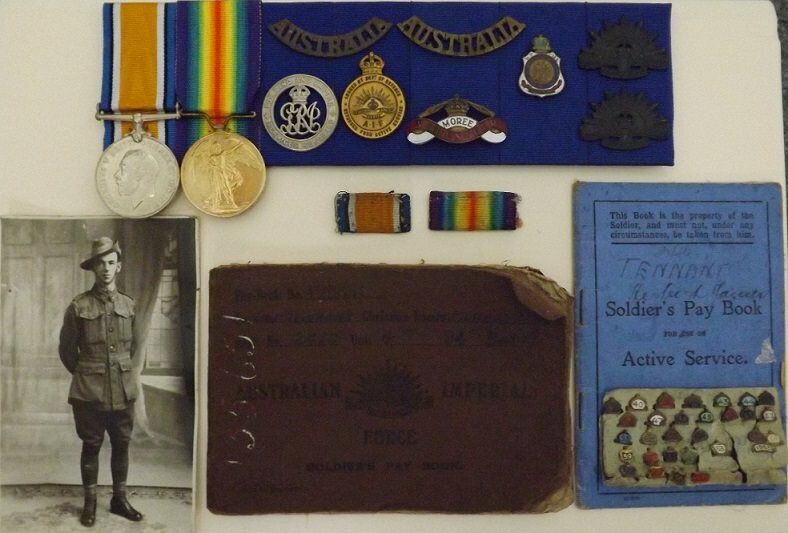 After treatment Hubert was transferred to the 1st Australian General Hospital at Rouen on the 9th of June and after being discharged he was transferred to base Details and rejoined his unit from Hospital on the 10th July and went into the lines with his platoon. 2am : Relieved 43rd Bn. A.I.F. in Close Support Messines Sector (RIVER DOUVE to STIGNAST FARM -Belgium). Brigade relief. Supplied working parties while in Supports. We were at times subjected to fairly severe enemy shell fire while in Close Supports. Casualties from 11.7.17 to 17.7.17 were 34 including 6 killed. 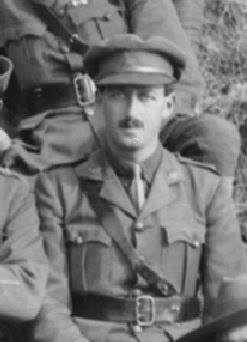 On the 16th July Hubert was Wounded in Action; 2nd occasion when he received a Gun Shot Wound to his Foot. (Self Inflicted) and was treated by the 10th Australian Field Ambulance before he was transferred to the 47th General Hospital at Rouen the next day. 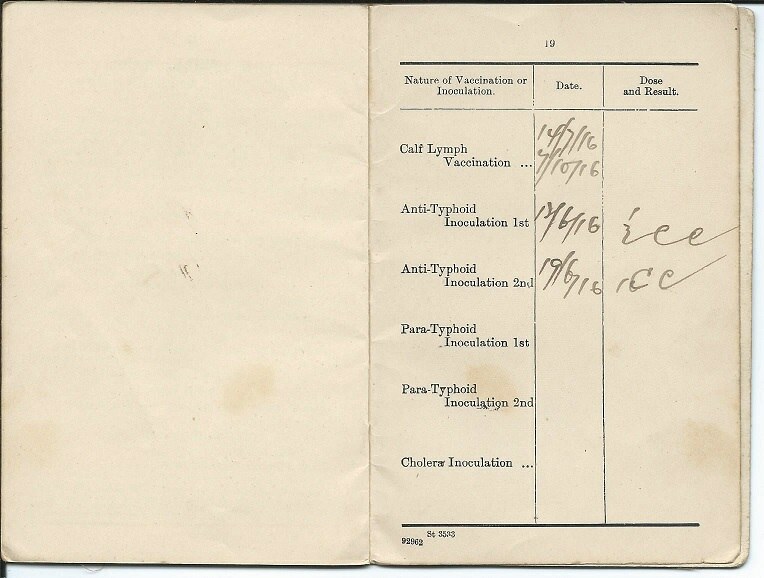 After Hubert was discharged from Hospital he was classified "B3" by the 2nd Medical Base Board (Self-Inflicted Wound) and was marched out to the Australian Infantry Base Depot at Havre on the 6th November 1918. Hubert was transferred to England on the on the 30th November and disembarked at Southampton and was marched in the the No:2 Command Depot at Weymouth. Hubert left England on board H.T. 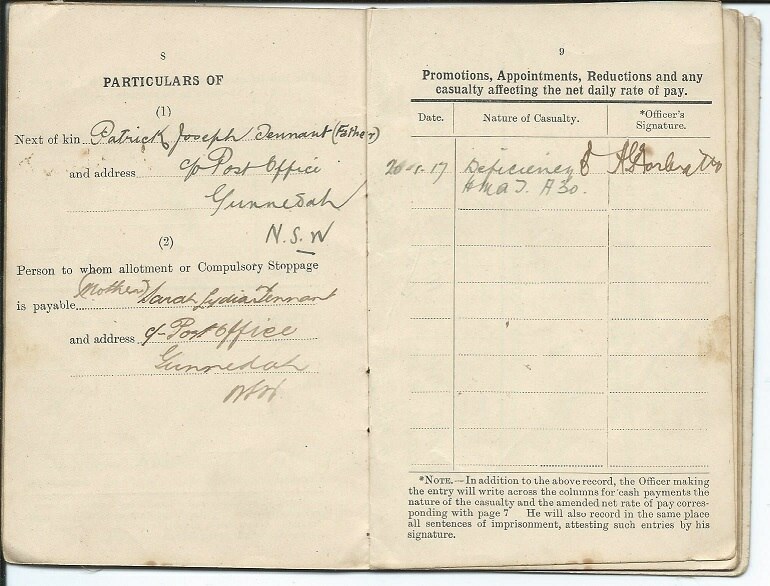 "Leicestershire" on the 9th December disembarking at Melbourne on the 22nd of January before he was discharged from the A.I.F on the 22nd March 1919 as Medically Unfit. This entire collection was purchased from the lindsay Mears Collection in 2016 and is now in the Harrower Collection. 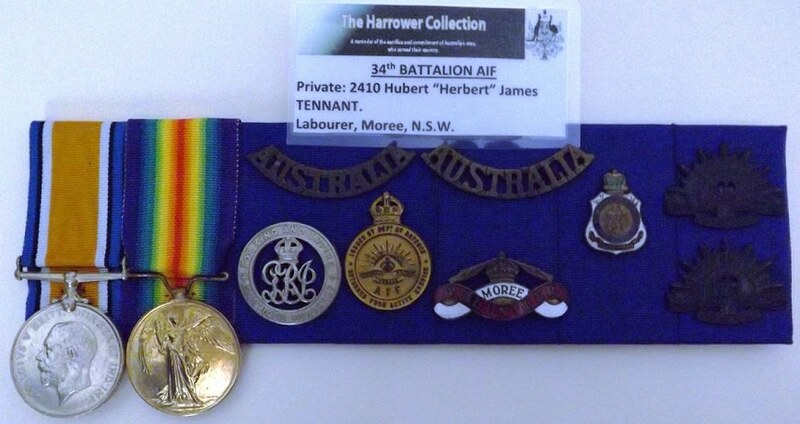 Hubert was a single 18 year old Labourer from Moree, N.S.W. upon enlistment. His parents Patrick Joseph and Sarah Lydia Tennant were married in 1894 at Boggabri, N.S.W. Marriage Cert: 2567/1894. Alma Tennant born 1895 at Boggabri, N.S.W. Birth Cert:30664/1895. Hubert James Tennant born 1897 at Gunnedah, N.S.W. Birth Cert:22168/1897 and died 1967 at Newcastle, N.S.W. Death Cert:22580/1967. Catherine A Tennant born 1899 at Narrabri, N.S.W. birth Cert:23186/1899. John Patrick Tennant born 1901 at Boggabri, N.S.W and died 1959 at Wallsend, N.S.W. Death Cert:12201/1959. Keith W Tennant born 1902 at Gunnedah, N.S.W. Birth Cert:32076/1902. Theresa M Tennant born 1904 at Gunnedah, N.S.W. Birth Cert:12691/1904. 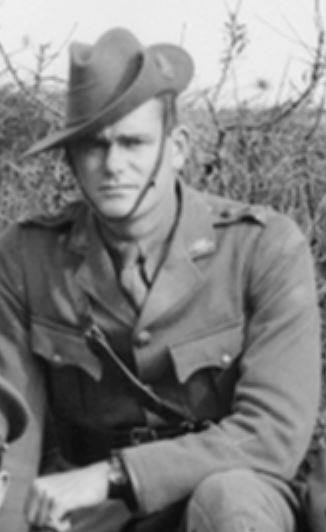 Arthur J Tennant born 1907 at Gunnedah, N.S.W. Birth Cert:13786/1907. Harvey Francis Tennantborn 1912 at Gunnedah, N.S.W. Birth Cert:4798/1912 and died 1977 N.S.W. Death Cert:10787/1977. Phyllis P Tennant born 1913 at Gunnedah, N.S.W. 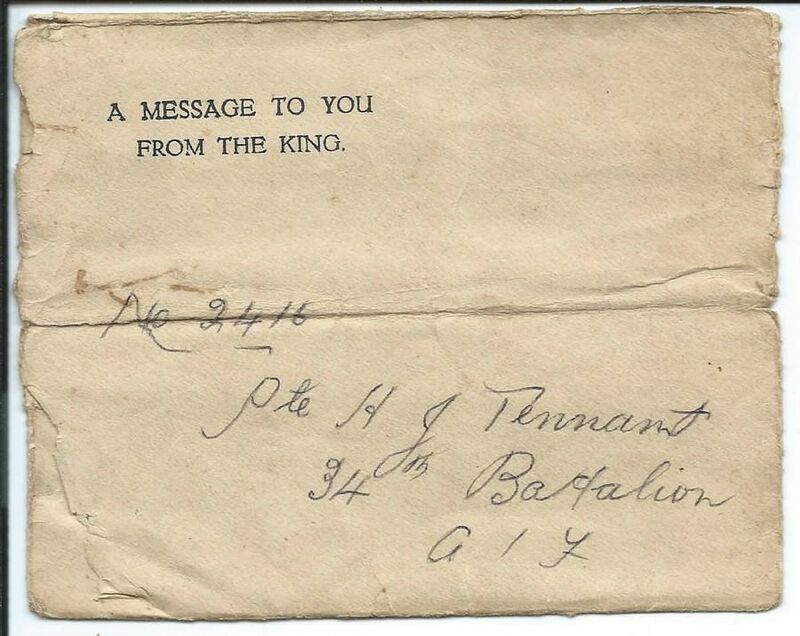 Birth Cert:16311/1913.Thomas Tennant died 1968 at Newcastle, N.S.W. Death Cert:43292/1968. Keith William Tennantdied 1903 at Gunnedah, N.S.W. Death Cert:1890/1903. Edna C.M. Tennant died 1910 at West Wallsend, N.S.W. Death Cert:2118/1910. Patrick William Tennant died 1984 N.S.W. Death Cert:101350/1984. 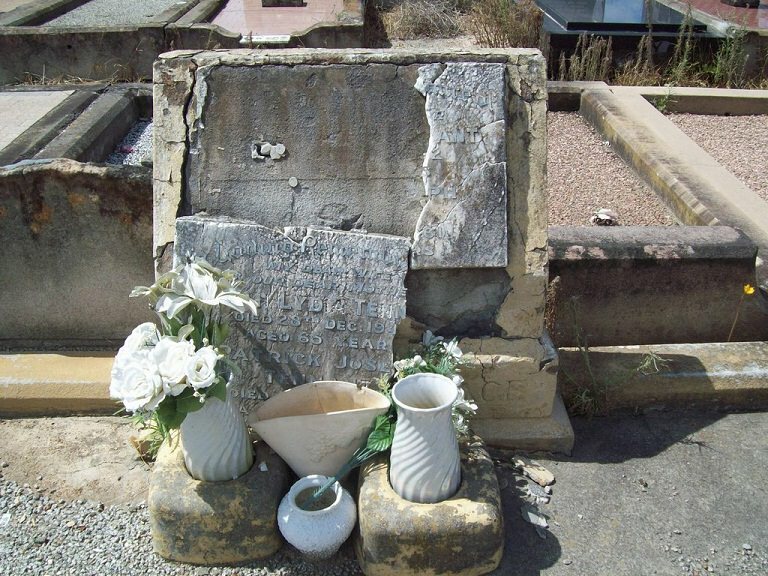 Patrick Joseph Tennant was buried at Sandgate Cemetery on the 13th September 1961, Catholic Section 63, Lot: 88 with his wife Sarah Lydia Tennant who was buried on the 29th December 1942.